There is already an article explaining how to export from THTMLViewer using eDocEngine. However, it tried to solve a bit more complicated problem (for a customer who wanted to export from XML to PDF) and is hence a bit convoluted. It applies an XSL stylesheet to XML data, generates a HTML page and then exports it to PDF. Here is a more straight-forward version. The THTMLViewer component is from http://www.songbeamer.com/delphi/, who provided an updated version of David Baldwin's HTML Display Components (ThtmlViewer, TFrameViewer, and TFrameBrowser). A copy of it is also shipped with eDocEngine. 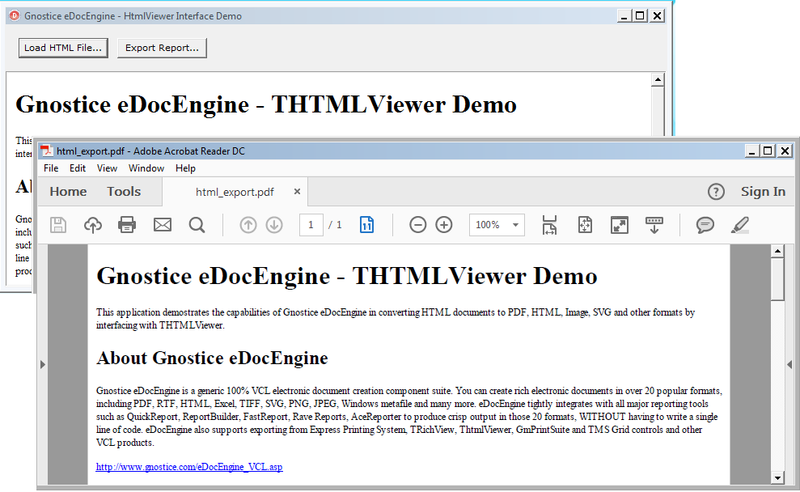 In this video, the THTMLViewer package is installed from source and then used in a VCL Forms application project to export a HTML page to PDF. Here is the code. It convert a HTML document found in the RAD Studio folder. Please note that THTMLViewer can display only simple documents.